AniTAY sat down recently with Republican candidate, and decomposing prehensile curry bread attempting to rewrite the code of the VR MMO we call Earth with the rest of us unable to log out*, Donald J. Trump, to hear his thoughts on the most pressing issue of the day: the state of anime. Rakugo is the greatest anime ever. Let me tell you. It’s the best. People say to me, “But Donald, most people haven’t watched it” and I say, “I know”. We’ll build a wall, a huge massive wall, to keep those people out. The best wall for the best anime. You know who’s one of the great beauties of the world, according to everybody? Miyokichi. Absolutely tremendous. Konatsu too. I don’t get it. Insight? Let me tell you about insight. Gatchaman are big and strong because they listen to a panda. You know who has pandas? China. China are better than us. We should look at China. I do business with China and so I know how things run. I could lead the Gatchaman. The solution is simple. A total and complete shutdown of parasites entering Earth until our world’s representatives can figure out what’s going on. The real problem though is those guys in Washington, they’re already parasites. You saw the show. And look at Hillary. I’m not saying she is a parasite, but how do we know? Do you know what happened in Benghazi? We don’t know, because she wasn’t using government servers. No, it’s the truth. People know. You know, I was talking to my friends the other day, and they were saying “Donald, how would you solve the energy crisis?”, and I said, “Listen, you don’t have to worry. I know how to beat energy problems”. I was watching this Japanese documentary and they were talking about Dimension W where they get this infinite energy from. And I was thinking, why don’t we have that? Why does Asia have that and we don’t? I’ll tell you why. Obama. I could get us that energy. I already have connections and I could get us that energy cheap. Wall Rose was a terrible wall. I will build a great wall – and nobody builds walls better than me, believe me – and I’ll build them very inexpensively. I will build a great, great wall and I will make Titans pay for that wall. With their blood. Mark my words. I know walls. I like Gendo, I really do, but he’s not a good director. When NERV sends its people, they’re not sending the best. They’re not sending you, they’re sending people that have lots of problems and they’re bringing those problems to us. I know pilots, great EVA pilots, who would do a tremendous job. We need to expand the programme and get the Lance of Longinus. The best. I love them. All anime should be like them. Look, I don’t know what to tell you. It’s an emotion or experience of finding something overwhelmingly cute, pathetic, or touching, usually in a way that sparks an intense, protective urge. Tremendous urges. It commonly refers to cute female characters – who have all flirted with me by the way – but can extend to animals, elderly characters, real people, or anything that triggers the emotional response. You know, and I just want to be clear, all the waifus flirted with me – consciously or unconsciously. I have 2D kanojos and 3D women like my wife and Ivanka around me. Beautiful women. That’s to be expected. It could be a character, person, thing, or behavior that triggers the moe feeling. Those vets I raised so much money for? Moe. You know, many people think moe refers to an art style that is created with the aim to cause emotional response, but this is flat out wrong. Listen, while cutely stylized character designs can be moe, moe is not in and of itself an art style. Moe originally comes from the Japanese verb moeru, which means “to bud” or “to sprout,” because these objects of affection are often youthful. Like my daughter. It is also a homonym for “to burn,” so it is equally used as a verb when one’s passion “burns” for the object of their affection. We have to obey the definitions of moe, but we have to expand the definitions. We better expand our definitions or we’re being a bunch of suckers. The USA is moe. I’m moe. It’s cute. 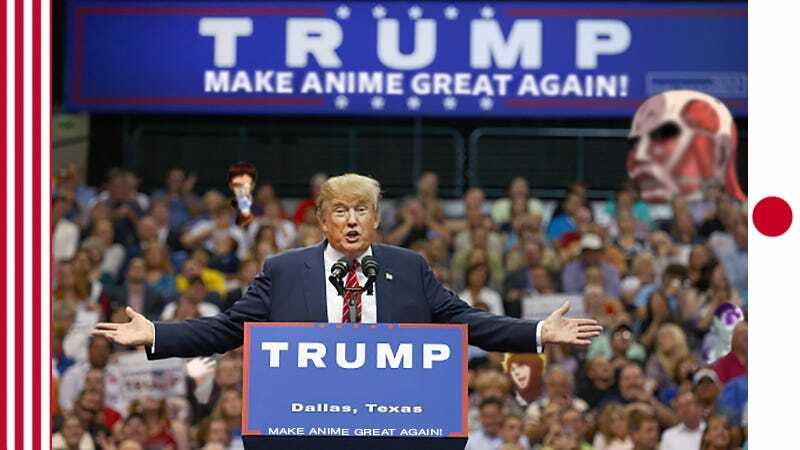 Let’s make anime great again! King Drumf: misguided as always. *In the interest of political fairness, the author would also like to note his disdain for Ted Cruz, a man so mediocre, yet so vile, that an anime-related joke was not sufficiently funny to temper his disgust. Feel free to submit your own. Thank you to Unimplied for the header. A declaration of appreciation for Memento Morie for providing the most comprehensive definition of moe I’ve read when I requested her “best definition”. The language of which I then butchered as one does when writing Trumpisms. And she she didn’t complain. Total pro. Sidenote: even in satire Trump manages to denigrate work by women. What an arse. For my less politically charged thoughts, check out Nomad’s Land.